Last April was the coldest on record. Birds that should have left stayed, and those that had returned during the warmer March days endured. At our bird feeding area, we hosted nine New World sparrow species. Migrants, winter visitors, and permanent residents by the dozen mingled on the ground, the back steps, and porch, eating birdseed as fast as I spread it. Eight species were the usual suspects; one was not. We had had as many as 60 dark-eyed juncos (Junco hyemalis) at our feeders all winter. These white-breasted, dark gray birds of the Sparrow Family Emberizidae had been trilling their song for weeks. Usually they have migrated farther north in Pennsylvania and beyond by mid-April, but last year they stayed for the entire month. So too did the several wintering white-throated sparrows (Zonotrichia albicollis), which were already singing their pensive “poor Sam Peabody” song, or, since large numbers of them breed in Canada, “Oh, sweet Canada” song. In fact, we heard one singing at the edge of First Field on May 22 during our first Important Bird Area (IBA) count! At least one eastern towhee (Pipilo erythrophthalmus), also a member of the Sparrow Family Emberizidae, had spent the winter on the mountain for the first time, but he had chosen a thicket more than a mile from our home, so the male that appeared at the feeders was probably a migrant back from the southern United States. We also had three wintering song sparrows (Melospiza melodia) that had been joined by several migrants during the cold spell in April. They too had been singing for several weeks, and their distinctive “Hip! Hip! Hurrah boys! Spring is here” song, along with the dark spot on their brown-streaked breasts, made them easy to identify. Five fox sparrows (Passerella iliaca) had appeared in mid-March, but four had left for their nesting grounds in Canada by April. Still, one of those large, rusty-brown, rufous-tailed sparrows remained through the cold spell, and even sang his brilliant musical song after the Good Friday snow. Then there were the usual three rusty-capped sparrow species. I heard the first singing American tree sparrow (Spizella arborea) on March 21, and most of those so-called “winter chippies” had left for their northern Canadian breeding grounds, but two still came regularly to the feeders in April. Their look-alike congener, the chipping sparrow (Spizella passerina), first appeared on March 27. Although both the chipping and tree sparrows have rusty caps, only the American tree sparrow sports a dark spot on its breast. In addition, the chipping sparrow has a clean white line above its eye and a black line through it, while the tree sparrow has a gray line rimmed with rusty-brown. Then too the tree sparrow sings a sweet, high song, but the chipping sparrow rattles on a single buzzy note, sounding more like an insect than a songbird. The first field sparrow (Spizella pusilla) returned on March 26. It also has a rusty cap and a plain breast, but its bill is pink, and it has a white eye ring. Its lovely, descending trill is one of my favorite spring songs. By then my husband Bruce was thoroughly confused. No matter how many times I tried to point out the differences between those “lbjs” or “little brown jobs,” as birders refer to most sparrow species, he could not confidently tell a field sparrow from a song sparrow or a chipping sparrow from a tree sparrow. Imagine his disbelief then, on April 5, when I looked outside in late afternoon at the birds mobbing the feeders and the ground beneath them and noticed a different rusty-capped sparrow. Its cap was a deeper chestnut than that of a chipping sparrow. It had gray instead of white above its eye, a dim white patch below its throat and no spot in the middle of its blurry-streaked chest like a song sparrow. Its wings were a reddish-brown without the wing bars of chipping, field, and tree sparrows. A swamp sparrow (Melospiza georgiana) had joined the sparrow throngs. Despite its rusty cap, though, it is most closely related to the song sparrow and Lincoln’s sparrow (Melospiza lincolnii), the latter of which is an uncommon migrant in Pennsylvania and does not breed in the state. Here on our dry mountaintop we had had only fleeting glimpses of the elusive swamp sparrow during migration, so I was pleased to have more than two weeks to closely observe what was probably a male swamp sparrow because of its richer chestnut crown and cap color and because male swamp sparrows migrate ahead of females. He did, however, shed his shy, retiring nature at the feeding area and was incredibly feisty as he competed for food. First called “reed sparrow” by Pennsylvania naturalist William Bartram, it was bird artist Alexander Wilson, a Scottish immigrant in Philadelphia, who, in 1811, named it “swamp sparrow.” It breeds in Canada south of the tree line from British Columbia to Newfoundland and in the United States east of the Rockies except for much of the cultivated prairies belt and south to Virginia. It can winter as far north as southern Ontario but mostly in the southern United States. Although research done in the Erie National Wildlife Refuge by Russell Greenberg in 1985 and 1986 found that the later arriving swamp sparrows, which are smaller and socially subordinate to song sparrows, were relegated to wetlands because song sparrows had already settled on the drier territories, swamp sparrows are also physically suited to wetlands. Their legs are longer than those of song sparrows. This allows them to wade in shallow water for long periods and pick both insect and plant food from the water’s surface. 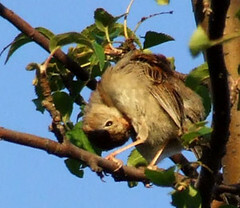 They also move through the bases of dense shrubbery, unlike song sparrows, which seem unable to move through thick vegetation and search for food floating on water.Earlier observers of swamp sparrows described them as wading “in shallow water like a sandpiper,” and “splashing through the water like little muskrats.” T.S. Roberts wrote that a swamp sparrow “climbs up and down the coarse stems of the reeds and bushy shoots in a nimble, mouse-like manner…” In summary, shallow standing water, low dense cover, and elevated song posts provide ideal habitat for breeding swamp sparrows. But in migration, although they prefer thick vegetation near water, they also visit old fields, farm hedgerows, blackberry thickets, and even residential shrubbery — habitat that we have around our feeder area and nearby. They don’t always avoid woods and mountains either, especially if they include small swamps, bogs, or swales in forest openings such as our small swamp at the base of First Field. Nevertheless, song sparrows always occupy our shrubby environs, even those wet areas near our springhouse, so the swamp sparrow left when it warmed up on April 19. I like to think that he ended his migration in a northwestern Pennsylvania swamp where his musical “weet-weet-weet” trill attracted a mate. He would have declared his territorial boundaries from several elevated song posts and even shifted his boundaries as surface water shifted. She would have sat on another perch, fluttered her wings and softly mewed. He would have quickly searched for her and formed what is usually a monogamous union for the season. The female swamp sparrow selects the nest site and builds her nest in three to four days. At Pymatuning Reservoir, most swamp sparrow nests are constructed between cattail stalks or on bent over clumps of leaves and are hidden in or under dense vegetation. The nest is rough on the outside and neat on the inside and is composed of local grasses, sedges, cattails and other plant materials. She lays an average of four strongly marked, pale green eggs at Pymatuning Reservoir anywhere from May 20 to July 18 according to ornithologist Melissa Hughes. She then incubates the eggs 12 to 14 days. After that, she broods the nestlings, and both parents feed them. It takes another 9 to 11 days for the altricial young to fledge, although if they are disturbed at 7 days of age they can already flutter to the ground and later from branch to branch. The parents may continue to feed them for another two weeks. Most swamp sparrows in Pennsylvania raise two broods a season. At any time during egg-laying, incubation and nestling stages, a host of predators can interfere. Blue jays are the major predator, but other suspects include minks, northern water snakes, garter snakes, voles, raccoons, and common grackles. 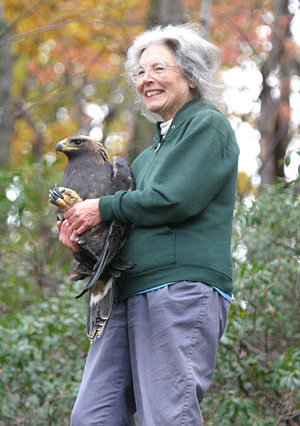 Hughes reports that eggs were often stolen one or two at a time at Pymatuning, and she suspects either garter snakes or voles. Flooding sometimes kills broods too. In general, unusually harsh weather as well as cats, dogs, hawks, owls, shrikes and rodents kill swamp sparrows throughout the year. But wetland loss remains the greatest threat to this species. When a beaver pond was drained at the Erie National Wildlife Refuge back in 1985, the number of breeding swamp sparrows went from five to zero, and the dried-up land was claimed by song sparrows. The extensive wetlands in northwest Pennsylvania are particularly important to swamp sparrows because they provide many breeding territories lightly impacted by humans that produce high quality abundant food for swamp sparrow families. They mostly eat weeds and fruits in the winter, but during the breeding season they also consume a wide variety of insects such as damselflies, dragonflies, beetles, ants, bees and aphids. Fledglings and adults eat plant food as well and especially like the fleshy insides of high bush blueberries. During late summer and fall the seeds of sedges, smartweed, panic grass and vervain are popular. By late April my sparrow April was mostly over. Not only had the swamp sparrow left but also the American tree, fox, and white-throated sparrows and the dark-eyed juncos. Field, chipping, and song sparrows and eastern towhees had set up territories in the yard, overgrown fields, and shrubby areas. True spring had arrived at last. 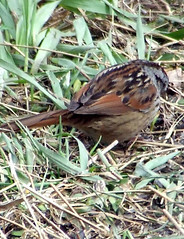 Photos: Dark-eyed junco by tcd123usa; Towhee by Henry McLin; American tree sparrow by ericbegin2000; Field sparrow and first photo of swamp sparrow (the same individual discussed in the article) by Dave Bonta; first large photo of swamp sparrow by Fritz Myer; second large photo of swamp sparrow by Scott A. Young. Thanks to the photographers for licensing their photos under Creative Commons for free, non-commercial use with attribution. This entry was posted in Animal Behavior, Birds, Brush Mountain/ Plummer’s Hollow, sparrows, swamp sparrow. Bookmark the permalink. Thanks for your comment. I’m glad you like it. I checked out your site and loved your photos and your dialogue. I could agree with so much of what you said. Thank you for such an informative site, I always enjoy reading it – being down here in the Southern Ocean with autumn happening, it is so interesting to read about your neck of the woods. I may be biased, but NZ is beautiful ! I live in the North Island about 40 mins from the west coast – a stunning coast line with beautiful scenery and the some of the best surf spots in the world. You kept bees ? We don`t have any predetors here that would harm the hives, no snakes or dangerous spiders. NZ had only 2 mammels before the Maori arrived – seals and a tiny bat !We do have beautiful flora and fauna. I have your book `Women in the Field’ and have read it twice, I so enjoyed it – thank you !! I would dearly love to read more of your books, but have not seen them here. I came across `Women in the Field’ at Borders in Auckland and I could possibly order others. I am extremely interested in history – especially plants, I dream about becoming a botanist ! Thanks for your interest in “Women in the Field.” My other books, including “American Women Afield,” are available through Amazon.com. That may be a problem for you in New Zealand. But at least here, it is difficult to persuade bookstores to keep books on the shelf that are older. Also, for your interest, my first book, the only one that is not in print–“Escape to the Mountain; A Family’s Adventures in the Wilderness” first published in 1980 is being republished by Axios Press in September. As far as New Zealand is concerned, I know only from many photos and articles that it is indeed a beautiful place. But I might miss the mammals. For instance, I watched a porcupine in a tree this morning; I saw a fisher in the woods the other week, and, from our veranda, we watched a mother bear and her four cubs from last year, eating and playing at the top of First Field for over an hour. I can only imagine how great that would be, to watch bears in their natural habitat !! I am going to try and order your Appalacian Seasons series through my local bookshop, I have brought books through Amazon before but will try here first. One of my dreams is to walk the Appalacian Trail ..
NZ, as you probably know, was isolated from the rest of the world for millions of years so we have the most amazing plants and birds. Not quite as many as Aust, but because of the lack of predators, the flightless Kiwi evolved and species of Wattle birds, eg the Kokaho would hop through the bush form tree to tree, they can fly but didn`t really need to – until man arrived with rats etc ! !Our bird song is truely beautiful and there is nothing as special as being woken by the dawn chorus !